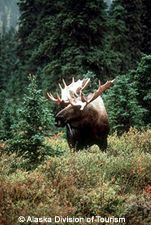 It's hard to find a single image that describes Alaska's boreal forest. It's a land of multiple, sometimes contrasting scenes: A stand of slender black spruce trees, scattered across a landscape of lush moss and lichen… A moose, wading shoulder-deep in a pond… A grove of paper birch, glowing yellow on the hillside… A moonlit willow thicket, laced with hare trails through the snow… Caribou fording a glacial river… black bear and red fox, cranberry and rose, black spruce and white spruce, lynx and loon. 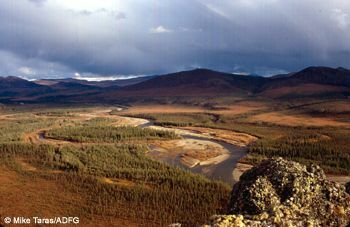 Alaska's boreal forest (sometimes called "taiga") is often portrayed as a monotonous blanket of spindly evergreens, covering the hills and valleys of the far north. In reality, it's a complex mosaic of forest types-from sunny aspen groves to spruce bogs-intermingled with meadows, marshes, lakes, and rivers, and supporting a diverse complement of animals. What shapes this ecosystem? Cold weather (it's the coldest terrestrial ecosystem on Earth), long winters, permafrost, and forest fires all contribute to the tapestry of Alaska's boreal forest. Black spruce and white spruce are the most common conifers in this huge ecosystem. Balsam poplar, paper birch, and aspen grow on south-facing, recently disturbed sites such as river bars and recent burns. Common shrubs include willow, highbush cranberry, alder, rose, Labrador tea, and blueberry. Groundcover plants include mosses, lichens, grasses, sedges, and lowbush cranberry. Horsetail is common.